Contact Me- I am available from 6pm-9pm EST on weekdays and weekends. Other times I am fixing radios or on the air! About Me- As I said before; I am a Yaesu FT-101 owner, avid collector, and operator. I have Worked All Continents (WAC), Worked All States (WAS), and 150 countries on DXCC. I have a 50' 3-section crank-up tower that tilts over. It supports an Explorer EXP-14 tri-band beam, along with an 80M wire dipole that I can load up on other bands. I enjoy SWL at night on a Yaesu FRG-7700, another Yaesu! During my early morning (6am) commute, I enjoy listening to distant AM broadcasts. Yaesu FT-101 Board Extenders (a complete Factory set) to extend any board for testing. Spare plug-in boards to quickly determine on-board or in-chassis fault. Parts Radios for that impossible-to-find part. Forget eBay! I know what I have works! Wide-Screen HD 21:9 display for all manuals and reference materials. No one uses paper anymore! Motorola R2004D/HS Service monitor- Spectrum Analyzer, Wattmeter, RF&AF Generator, Tone Generators, O'scope, etc. 100 MHz Tektronix TDS-220 oscilloscope, 2-Channel, XY mode for Trapezoid Linearity Test. 5,000 Volt probes for live high-voltage power supply tests (750V FT-101, 2500V FL-2100B, 1300V YO-101). Fluke 189 multimeter with 1000 VDC capability with Test Probes. Measure all HV and LV rail voltages and ripple content. Temperature controlled pencil soldering station. Kester solder and flux. Temperature controlled hot-air surface mount re-work station- used on FT-101s to soften "stuck" waxed tuning slugs! Eico 667 Tube and Transistor Tester. Complete tube testing and performance measurements. TC-1 Transistor Tester- electrical parameters including hfe. TC-1 Diode Tester- electrical performance for single and matched diode-quads (mixer). TC-1 Capacitor Tester- capacitance, ESR, and loss. 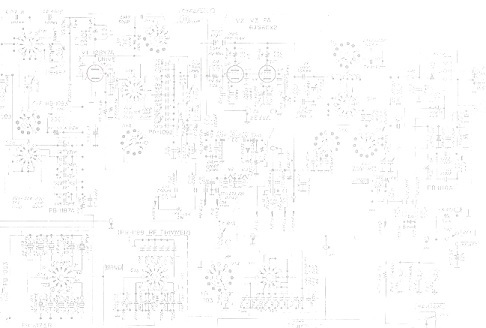 Quickly determine capacitor health. TC-1 Inductor Tester- inductance and resistance. Colored spools of hook-up wire to color-match the FT-101 chassis wiring. ESD-Safe and Grounded workbench- not needed for FT-101s, more of a padded and scratch resistant surface for your FT-101. Temperature and Humidity controlled work environment. It is a great place to work! 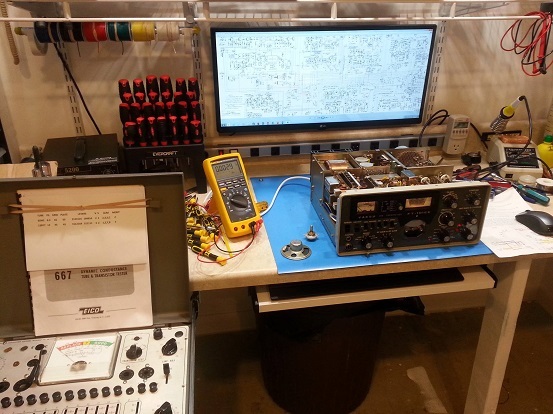 A partial view of the FT-101 Repair service bench.